“Goose with Holly” is embossed on tan confetti card stock in gold. “Line Art Holly, Sm.” is embossed in gold and colored. The Line art holly is stamped again, colored, cut out and mounted with foam dots over the previously stamped and colored image to give a 3-D appearance. Straw is glued at the feet of the goose. Crystal Lacquer over the holly berries is then applied. The card is layered on green, red and ivory card stock. Card by Mary Hansen. 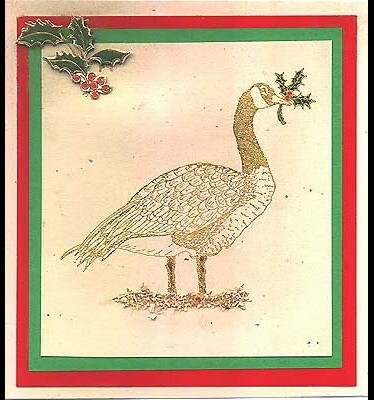 Tags: Crystal Lacquer, Embossed, Foam tape, Goose with Holly, Line Art Holly, Mary Hansen, Sm.